This month there are some small but useful updates to Office 365 to share with your users. There have been a number of important announcement about the future of SharePoint and Office 365 at the Microsoft Ignite Conference. Click here to see an overview of what was being talked about. The new App Launcher is currently being rolled out. This gives a quicker way for users to find their recently used or newest apps. AMT has created a ‘Mandatory Read’ feature to plug a gap that currently exists within SharePoint. With this feature, you can display a panel indicating that a document must be read. 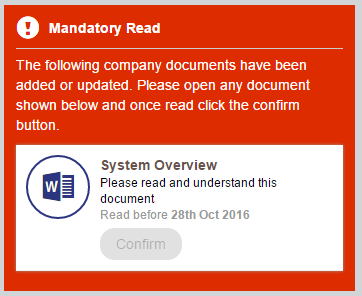 The panel can only be dismissed once the user has opened the document and confirmed that they have read its contents. News has had a makeover within SharePoint Online to make it even easier to share updates, reports, best practices, goals, and all manner of team announcements. The news is optimised to display on the new Teamsite Home Page and for display on mobile devices. It will soon also send mobile and email notifications of new updates, to make sure that you keep up to date. 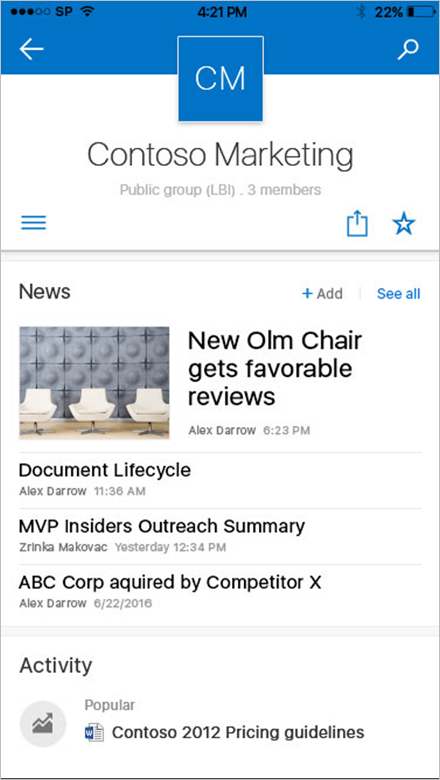 SharePoint is now available as an app for Android and Windows 10 devices, to join the iPhone app already released in preview. These give you quick access to your intranet and team sites, easy search for documents and people using Delve, an Activity View showing you what has recently changed, and many more useful features to help you keep up to date when you’re on the move. If you like the idea of using Yammer to get your staff collaborating and sharing ideas, but have been put off by its lack of integration with SharePoint and OneDrive, it’s a good time to have another look. A series of updates are about to be released that tie it in very closely to SharePoint Libraries, Groups, OneDrive, OneDrive for Business and OneNote. 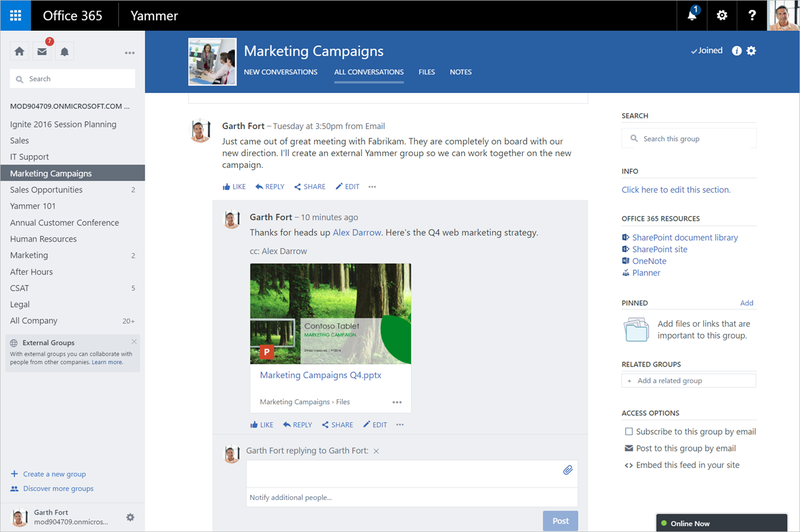 If you think of how you share a link in Facebook or LinkedIn, this is how sharing will work in Yammer. You will be able to quickly link a document through to Yammer and kick off a discussion with everything nicely tied together.Find out how Yammer is being embedded within Office 365. We’ve been giving you updates about the new Admin Centre over the last few months. This is now being rolled out globally, and the old ‘classic’ experience will be turned off on December 31st.The new Admin Centre has additional functionality – particularly around reports, giving you detailed information about who is using what in Office 365. 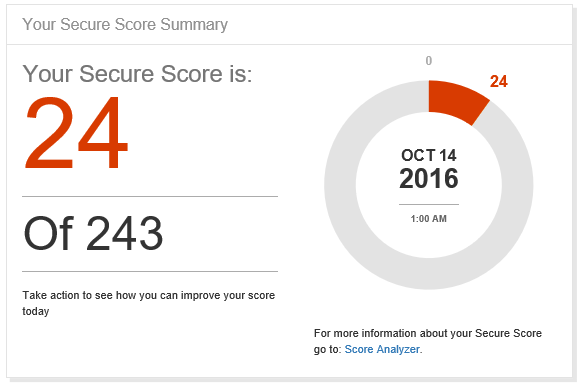 Office 365 Secure Score is currently being rolled out in preview. This is an Admin feature that will create a ‘credit score’ for your Office 365 installation, helping you understand your current risk level , and giving you actions to do to reduce that risk.It runs in real time, collecting and analyzing information in the background for you to view. Click here for more information. Yammer events will now be included in the Office 365 Audit Log and through the Management Activity API. This means that administrators will be able to closely monitor the usage of Yammer and also integrate it with other Apps being built. next post: 60 Second Briefing – What is Office 365 Planner?